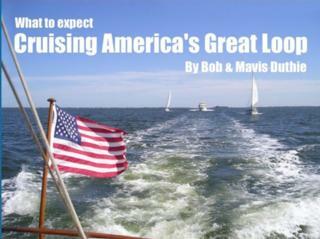 Ten years ago we developed our first Duthie Learning course, What to Expect Touring America's Great Loop. It was introduced as a $29.95 CD-ROM and sold through marine book stores, marinas, and this website. It ran on Windows and Apple computers. Five years ago Apple introduced a new operating system that no longer supported legacy applications. We had to tell Apple customers they needed to install the Windows operating system. That was not very popular. Then along came smart phones and tablets, and CD-ROM drives were being eliminated on many new computers. In searching for a solution to deliver our content we discovered MP4 video. The Snagit video capture tool and Camtasia Studio 8 video editor made it easy to repurpose our content. We could play the Great Loop CD-ROM version and convert it into a set of very compact MP4 video clips. Now our content would play on just about any device from computers to smart phones and even digital TVs. Most Great Loop sales are now downloads from our website or USB drives containing the program. Two years ago we developed a new video program for RVers, What To Expect Touring America's Great Southwest. In 18 months it sold 3 copies. An interview with an RV friend gave a clue as to why it didn't sell. 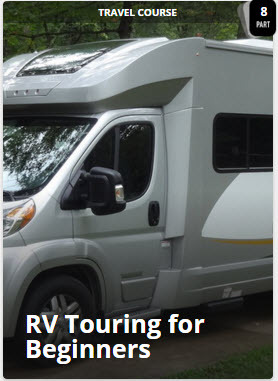 RVers don't plan trips according to a route. Instead they decide who they want to visit, what places they want to see, and then figure out a route that connects these places together. We needed a new way to deliver our content. A year ago we discovered Curious.com. This education website for adult learning provides a subscription service at low cost that lets users access thousands of lessons and courses online via computer, tablets, and smart phones. It was very easy to repurpose the Great Southwest program into 5 courses and 27 lessons. Each lesson covers one place we have visited. For example the Utah course has 9 lessons, each describing our visit to a place such as Zion National Park. Users can then pick and choose what places they want to see or see them all. We continue our concept photos with recorded narration. Camtasia only stores a photo once which remains on the screen while the narration is heard. Other video programs download a photo 30 times per second resulting in very large files being downloaded. The Camtasia approach reduces delays in streaming the videos. The Curious.com platform provides for quizes in each lesson. The video is paused while the quiz questions are answered. Typically there is a one or two multiple choice quiz questions every 3 minutes. Quizes give learners a break and improve retention. Another feature of the platform allows attachments in each lesson. We use this to provide a pdf file of the script which allows users to search for information in a course. We are also allowed to have attachments that go to other websites including greatloopcruising.com. Curious.com asked us to create a primer for new RVers. This course is called RV Touring for Beginners and is now available online. It forms a companion to the Great Southwest courses. It took 4 months to develop including script, voiceovers, video production and quiz creation. The program has 8 lessons covering why RV tour, choosing an RV, buying or renting an RV, RV systems, and planning the first trip. Overall the course takes 76 minutes plus quiz time. We are now converting the Great Loop program in to the same format. It will be one course with 39 lessons and takes 6.5 hours to cover. It contains many more video clips than the CD-ROM version. Our next program will be Touring the Wonders of Florida and will cover the more than 50 places we have visited in 5 different trips. All programs have free samples of a minute or two of our content found at the beginning of most lessons. Just open your browser and go to curious.com/bobduthie You can enroll in a free trial when you set up an account. If you access this link here you will get a $25 credit on your membership. Membershps are $9.95 per month or $89.95 per year. A membership allows you to take any number of the 20,000 lessons on the system which cover a enormous range of topics of interest to adults. Remember learning is good for your health as long as what you are learning is of interest to you. You don't have to buy a boat to learn about the Great Loop, or buy an RV to learn how to tour the continent.